2.6 দ্বিতীয় বিশ্বযুদ্ধ আৰু "ভাৰত ত্যাগ আন্দোলন"
এই পৱিত্ৰ স্থানত মই কওঁ যে যদি আপুনি 'হিন্দু ধৰ্ম'ক ৰক্ষা কৰিব বিচাৰিছে, তেন্তে অসহযোগেই হৈছে আপুনি আয়ত্ব কৰিবলগীয়া প্ৰথম আৰু অন্তিম পন্থা।' ("At this holy place, I declare, if you want to protect your 'Hindu Dharma', non-cooperation is first as well as the last lesson you must learn up.". "মহাত্মা গান্ধীয়ে কেতিয়াও ব্ৰিটিছ শাসিত ভাৰতবৰ্ষৰ বিভাজন সমৰ্থন বা গ্ৰহন কৰা নাছিল ... কিন্তু তেওঁ বেছ পলমকৈহে ধৰিব পাৰিছিল যে তেওঁৰ নিকটতম সহকৰ্মী আৰু অনুগামীসকল আদৰ্শতকৈ ক্ষমতাৰ প্ৰতিহে বেছি লালায়িত আছিল, আৰু তেখেতৰ নিজস্ব দৰ্শনো এই ধাৰণাৰ দ্বাৰা ভ্ৰমিত আছিল যে তেখেতে নেতৃত্ব দিয়া ভাৰতৰ স্বাধীনতা সংগ্ৰাম অহিংস আছিল।"
"..plan to carve up British India was never approved of or accepted by Gandhi...who realised too late that his closest comrades and disciples were more interested in power than principle, and that his own vision had long been clouded by the illusion that the struggle he led for India's freedom was a nonviolent one." ↑ Gandhi,(1940). Chapter "Recruiting Campaign". ↑ 3.0 3.1 Desai, (1930). ↑ Gandhi, (1965) Collected Works, Vol 17. "Chapter 8. Letter to J. L. Maffey", Nadiad, 30 April 1918. ↑ Claude Markovits (2004). A History of Modern India, 1480-1950. Anthem Press. পৃষ্ঠা. 367–86. http://books.google.com/books?id=uzOmy2y0Zh4C. ↑ Unattributed (2004). 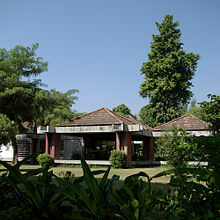 "Satyagraha Laboratories Of Mahatma Gandhi". Indian National Congress website. All India Congress Committee. http://web.archive.org/web/20061206050856/http://www.aicc.org.in/satyagraha_laboratories_of_mahatma_gandhi.htm। আহৰণ কৰা হৈছে: 25 February 2012. ↑ Gandhi, Rajmohan (2006),pp. 196–197. ↑ Kham, Aqeeluzzafar (1990). "The All-India Muslim Conference and the Origin of the Khilafat Movement in India". Journal of the Pakistan Historical Society খণ্ড 38 (2): 155–162. ↑ Roberts, W. H. (1923). "A Review of the Gandhi Movement in India". Political Science Quarterly খণ্ড 38 (2): 227–248. ↑ Sugata Bose; Ayesha Jalal (2004). Modern South Asia: History, Culture, Political Economy. Psychology Press. পৃষ্ঠা. 112–14. http://books.google.com/books?id=qMJIuHL9ksAC&pg=PA112. ↑ Judith Margaret Brown (1991). Gandhi: Prisoner of Hope. Yale University Press. পৃষ্ঠা. 140–47. http://books.google.com/books?id=boDAE8MLAJMC&pg=PA141. ↑ Wilhelm von Pochhammer (2005). India's Road to Nationhood: A Political History of the Subcontinent. Allied Publishers. পৃষ্ঠা. 440. http://books.google.com/books?id=mHLB4m75pisC&pg=PA437. ↑ Sumit Sarkar (1983). 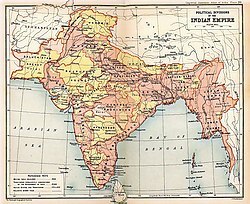 Modern India: 1885-1947. Macmillan. পৃষ্ঠা. 233. https://www.google.com/search?tbo=p&tbm=bks&q=%22155+killed%22+intitle:modern+intitle:india+inauthor:sarkar&num=10. ↑ Claude Markovits, ed. (2004). A History of Modern India, 1480-1950. Anthem Press. পৃষ্ঠা. 372. http://books.google.com/books?id=uzOmy2y0Zh4C&pg=PA372. ↑ Judith Margaret Brown (1994). Modern India: the origins of an Asian democracy. Oxford U. Press. পৃষ্ঠা. 228. http://books.google.com/books?id=Eq7tAAAAMAAJ. ↑ Gandhi 1990, পৃষ্ঠা. 82. ↑ Chakrabarty, Bidyut (2008). Indian politics and society since independence: events, processes and ideology. Routledge. পৃষ্ঠা. 154. ISBN 978-0-415-40868-4. http://books.google.com/books?id=QzQHZ178C24C&pg=PA154। আহৰণ কৰা হৈছে: 4 April 2012. ↑ Gandhi 1990, পৃষ্ঠা. 89. ↑ Unattributed (December 1931). 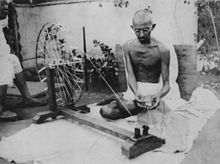 "Gandhi Invents Spinning Wheel". Popular Science (Bonnier Corporation): 60. http://books.google.com/books?id=ESgDAAAAMBAJ&pg=PA60। আহৰণ কৰা হৈছে: 14 January 2012. ↑ Shashi, (19960. p. 9. ↑ Gandhi 1990, পৃষ্ঠা. 105. ↑ Datta, Amaresh (1 January 2006). The Encyclopaedia Of Indian Literature (Volume Two) (Devraj To Jyoti). Sahitya Akademi. পৃষ্ঠা. 1345. ISBN 978-81-260-1194-0. http://books.google.com/books?id=zB4n3MVozbUC&pg=PA1345। আহৰণ কৰা হৈছে: 4 April 2012. ↑ Gandhi 1990, পৃষ্ঠা. 131. ↑ Jain, Jagdishchandra (1987). Gandhi, the forgotten Mahatma. প্ৰকাশক Delhi: Mittal Publications. পৃষ্ঠা. 17. ISBN 81-7099-037-8. http://books.google.co.in/books?id=NurqxSttqjoC&pg=PA17. ↑ Gandhi 1990, পৃষ্ঠা. 172. ↑ Hatt, (2002). p. 33. ↑ Herman (20080. pp. 375–377. ↑ Gandhi 1990, পৃষ্ঠা. 246. ↑ Gandhi 1990, পৃষ্ঠা. 277–281. ↑ Dash, Siddhartha. "Orissa Review". http://orissa.gov.in/e-magazine/Orissareview/jan2005/englishPdf/Gandhi_subhas.pdf। আহৰণ কৰা হৈছে: 12 April 2012. ↑ Gandhi 1990, পৃষ্ঠা. 283–286. ↑ Gandhi 1990, পৃষ্ঠা. 309. ↑ Gandhi 1990, পৃষ্ঠা. 318. ↑ Brock, Peter (1983). The Mahatma and mother India: essays on Gandhiʼs non-violence and nationalism. Navajivan Publishing House. পৃষ্ঠা. 34. http://books.google.com/books?id=vRduAAAAMAAJ&q=%22anarchy+to+the+present+system+of+administration+because+this+ordered+anarchy+is+worse+than+real+anarchy%22&dq=%22anarchy+to+the+present+system+of+administration+because+this+ordered+anarchy+is+worse+than+real+anarchy%22&hl=en&sa=X&ei=tZTsT_u2KMLdqgGVoKDqBQ&ved=0CEAQ6AEwAw. ↑ Limaye, Madhu (1990). Mahatma Gandhi and Jawaharlal Nehru: a historic partnership. B. R. Publishing Corporation. পৃষ্ঠা. 11. ISBN 8170185475. http://books.google.com/books?id=WVIwAQAAIAAJ&q=%22anarchy+to+the+present+system+of+administration+because+this+ordered+anarchy+is+worse+than+real+anarchy%22&dq=%22anarchy+to+the+present+system+of+administration+because+this+ordered+anarchy+is+worse+than+real+anarchy%22&hl=en&sa=X&ei=tZTsT_u2KMLdqgGVoKDqBQ&ved=0CEUQ6AEwBA. ↑ Wilhelm von Pochhammer (2005). India's Road to Nationhood: A Political History of the Subcontinent. Allied Publishers. পৃষ্ঠা. 469. http://books.google.com/books?id=mHLB4m75pisC&pg=PA469. ↑ Jalil, Azizul (1944). "When Gandhi met Jinnah". The Daily Star. Archived from the original on 22 February 2013. http://archive.is/Wnw51। আহৰণ কৰা হৈছে: 25 March 2012. ↑ Bhattacharya, Sanjoy (2001). Propaganda and information in Eastern India, 1939-45: a necessary weapon of war. Psychology Press. পৃষ্ঠা. 33. ISBN 978-0-7007-1406-3. http://books.google.com/books?id=M2GI26jditsC&pg=PA33. ↑ S. S. Shashi (1996). Encyclopaedia Indica: India, Pakistan, Bangladesh. Anmol Publications. পৃষ্ঠা. 13. ISBN 978-81-7041-859-7. http://books.google.com/books?id=Wv0vAQAAIAAJ। আহৰণ কৰা হৈছে: 28 February 2012. ↑ Reprinted in The Essential Gandhi: An Anthology of His Writings on His Life, Work, and Ideas, Louis Fischer, ed., 2002 (reprint edition) pp. 106–108. ↑ Keen, Shirin (Spring, 1998). "The Partition of India". Emory University. http://www.english.emory.edu/Bahri/Part.html. ↑ Gandhi, Mohandas Karamchand (5 January 1994). Jack, Homer A.. ed. 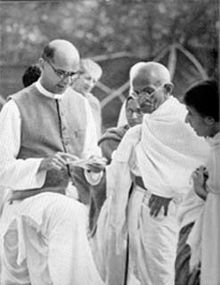 The Gandhi reader: a source book of his life and writings. Grove Press. পৃষ্ঠা. 418. ISBN 978-0-8021-3161-4. ↑ Wolpert, Stanley. Gandhi's Passion – The Life and Legacy of Mahatma Gandhi. Oxford University Press. ISBN 0-19-513060-X. http://www.nytimes.com/books/first/w/wolpert-gandhi.html. ↑ Tønnesson, Øyvind (1 December 1999). "Mahatma Gandhi, the Missing Laureate". Nobelprize.org. http://nobelprize.org/nobel_prizes/peace/articles/gandhi/। আহৰণ কৰা হৈছে: 16 January 2012. ↑ Metcalf, Barbara Daly; Metcalf, Thomas R.. A concise history of modern India. Cambridge University Press. পৃষ্ঠা. 221–222. ISBN 978-0-521-86362-9. http://books.google.com/books?id=iuESgYNYPl0C. ↑ Saikia, Bijoy Sankar (2 October 2006). "Why Mahatma Gandhi didn't get a Nobel Prize". CNN IBN-Live. http://ibnlive.in.com/news/why-mahatma-gandhi-didnt-get-a-nobel-prize/22985-3-single.html. Forest, G W (2000). The Indian Mutiny 1857–1858. প্ৰকাশক Delhi: Low Price Publications. ISBN 81-7536-196-4. Cristoforo, Gallolus (1989). Italian past. Oxford University Press. 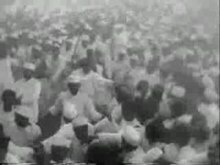 Nehru, Jawaharlal. Discovery of India. প্ৰকাশক Delhi. ISBN 0-19-562359-2. Collins, Larry; Lapierre, Dominique (1997). Freedom at Midnight. প্ৰকাশক London, England: HarperCollins. ISBN 0006388515. Chandra, Bipan; Mridula Mukherjee, Aditya Mukherjee, Sucheta Mahajan, K.N. Panikkar (1989). India's Struggle for Independence. প্ৰকাশক New Delhi: Penguin Books. পৃষ্ঠা. 600. ISBN 9780140107814. Heehs, Peter (1998). India's Freedom Struggle: A Short History. প্ৰকাশক Delhi: Oxford University Press. পৃষ্ঠা. 199. ISBN 9780195627985. Sarkar, Sumit (1983). Modern India: 1885-1947. প্ৰকাশক Madras: Macmillan. পৃষ্ঠা. 486. ISBN 0333904257. Brown, Giles (August 1948). The Hindu Conspiracy, 1914-1917.The Pacific Historical Review. 17. University of California Press. pp. 299–310. ISSN 0030-8684 . Popplewell, Richard J (1995). Intelligence and Imperial Defence: British Intelligence and the Defence of the Indian Empire 1904-1924.. Routledge. ISBN 9780714645803 . Hoover, Karl. (May 1985). The Hindu Conspiracy in California, 1913-1918. German Studies Review. 8. German Studies Association. pp. 245–261. ISBN 01497952 . Hopkirk, Peter (1997). Like Hidden Fire: The Plot to Bring Down the British Empire.. Kodansha Globe. ISBN 1568361270 . Fraser, Thomas G (1977). Germany and Indian Revolution, 1914-18. Journal of Contemporary History, Vol. 12, No. 2 (April, 1977), pp. 255-272. Sage Publications. ISSN 00220094 . Strachan, Hew (2001). The First World War. Volume I: To Arms. Oxford University Press. USA.. ISBN 0199261911 . Sarkar, B.K. (March 1921). Political Science Quarterly. 36. The Acedemy of Political Science. pp. 136–138. ISSN 00323195 . Tinker, Hugh (October 1968). India in the First World War and after. Journal of Contemporary History, 1918-19: From War to Peace. 3. Sage Publications. pp. 89–107. ISSN 00220094 . Dr.'Krant'M.L.Verma Swadhinta Sangram Ke Krantikari Sahitya Ka Itihas (3 Volumes) 2006 New Delhi Praveen Prakashan ISBN 8177831224. Sharma Vidyarnav Yug Ke Devta : Bismil Aur Ashfaq 2004 Delhi Praveen Prakashan ISBN 8177830783. 'Krant'M.L.Verma Sarfaroshi Ki Tamanna (4 Volumes) 1997 Delhi Praveen Prakashan. Dr. Mahaur Bhagwandas Kakori Shaheed Smriti 1977 Lucknow Kakori Shaheed Ardhshatabdi Samaroh Samiti. Majumdar, R.C.. History of the Freedom movement in India. ISBN 0836423763. Gandhi, Mohandas (1993). An Autobiography: The Story of My Experiments With Truth. প্ৰকাশক Boston: Beacon Press. ISBN 0807059099. Sofri, Gianni (1995–1999). Gandhi and India: A Century in Focus. Janet Sethre Paxia (translator) (English edition translated from the Italian সম্পাদনা). প্ৰকাশক Gloucestershire: The Windrush Press. ISBN 1900624125. Seal, Anil (1968). Emergence of Indian Nationalism: Competition and Collaboration in the Later Nineteenth Century. প্ৰকাশক London: Cambridge U.P.. ISBN 0521062748.